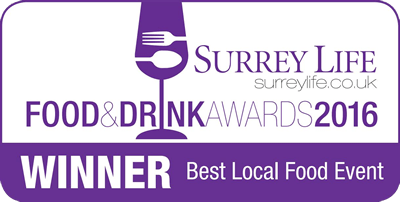 We're Surrey's Food and Drink Hero 2018 Thanks to everyone who voted for us! Photo highlights 2018 Check out this year's piccies! Woking Food and Drink Festival 2019 will take place from Friday 30 August to Sunday 1 September. This year we've received an unprecedented number of applications for traders stalls, which are now sold out. Interested traders can apply to join our waiting list. We're busy planning this year's event, which promises to deliver another magnificent mezze of culinary delights. In the meantime, why not whet your appetite by viewing our 2018 photo highlights!